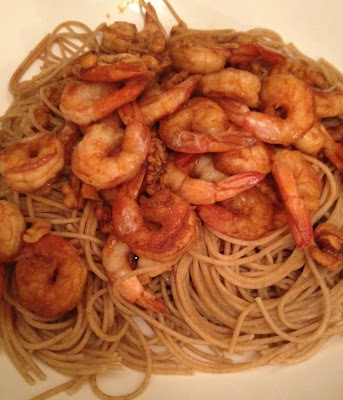 My friend Laura came over for dinner last night and I made this shrimp dish served over whole wheat pasta and accompanied with a broccoli salad on the side ( I will have to post that recipe some other time). If you are looking for a quick easy shrimp dish that's a little bit different, I recommend trying this recipe. It could also be served over rice. Recipe adapted from Power Foods. The original recipe called for turnips, but I hate turnips so I omitted. Apparently they were the 'Power food' in the recipe, adding fiber, potassium, calcium and vitamin D, so if you do like them, definitely add them in.